We're Launching 4 NEW Domain Extensions for Your Website! At SimpleSite we're proud to announce that we are now one of few providers to offer four brand new and modern top level domains. Why Upgrade to One of Our New Domain Extensions? You will be able to have your own personal email (eg. name@web.site) thanks to SimpleSite’s email domain address setup. Click on the green button to sign up for a website with personal domain straight away. If you don’t already have a SimpleSite, we invite you to try out our super easy website builder for FREE. If your preferred .com domain name is already taken, our new domain extensions still allow you to get an easy-to-remember, professionally looking domain for your website! You will have plenty of alternative domain names. You might even have better options than with the .com availability. Just compare Lenas.store to LenasStore.com – What would you prefer? Or Books.xyz compared to BooksXYZ.com? Remember domain names are permanent, and if you have any further questions you can read more about domains here or contact our customer service at customerservice@simplesite.com. Your domain name should be the same name as your own name or your brand’s name, or it should reflect the purpose of your website. For example: LenasArt.store or BestReads.xyz. It's important to choose a name that is easy for people to remember, and it should be unique enough not to be confused with other websites. You can get more tips on choosing the right domain from our article 6 Things To Keep In Mind When Choosing The Right Domain Name For Your Website. Remember: You don’t HAVE to use the same domain name as your SimpleSite username! You can always choose another domain name later on. At SimpleSite you can choose between all the domain extensions displayed below + most regional extensions – Get started with SimpleSite today. how to set up a bog? 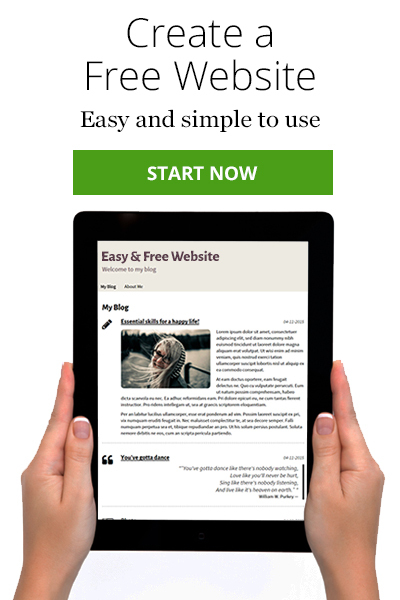 To get started on your SimpleSite blog, click the link below or the green button above. Your website will be online in just a few steps. If you have any questions, please feel free to contact our customer service at customerservice@simplesite.com.